Save 10% when you receive 5 or more products in one month to one address with auto-deliveries. Currently, you'll save 5% on your Jun 28 delivery. 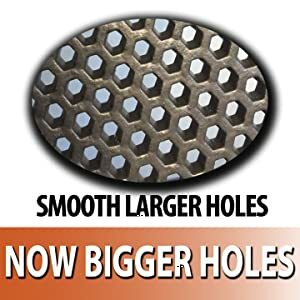 Sold by iPrimio USA and Fulfilled by Amazon. Sold by iPrimio USA and ships from Amazon Fulfillment. 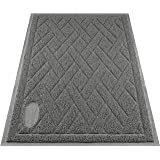 You may Walk Across the Mat and Not Feel the Litter - Great Design. 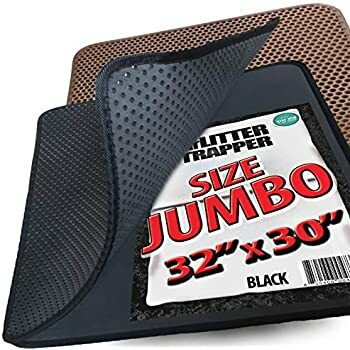 Jumbo Size 32" by 30"
Great for Cats who "miss the litter box..."
It is like placing a litter pad, or disposable pad, for your cat. 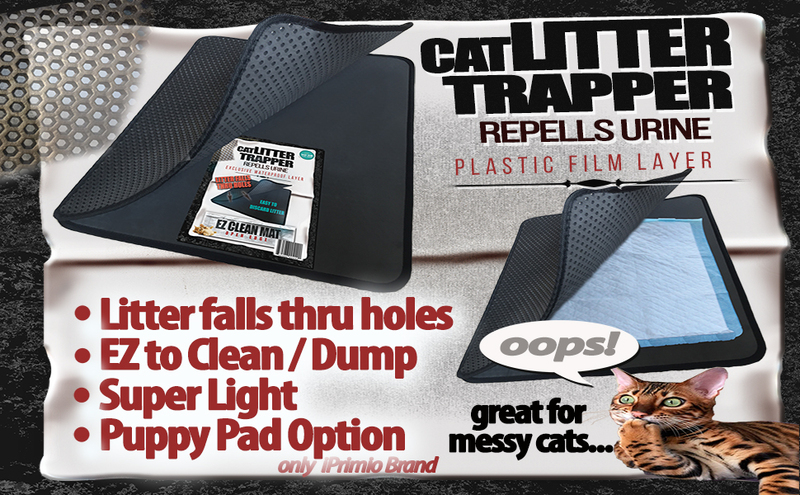 Why iPrimio Cat Litter Trapper? 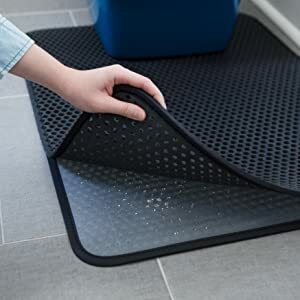 Our litter box mat has larger holes allowing more litter to pass through the blackhole. 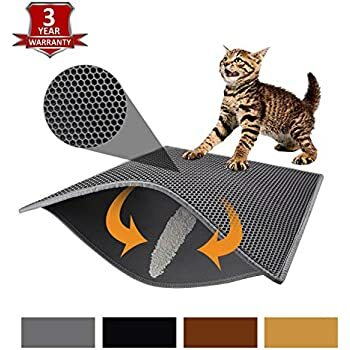 Much better than any litter rug that doesn't trap litter. 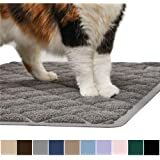 Whether you have a kitty, a cat, or a kitten, they will all use our mat. 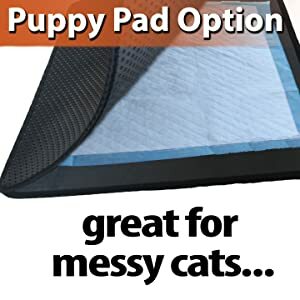 Works great with cover litter box, metal litter box, cat box, large cat litter boxes. 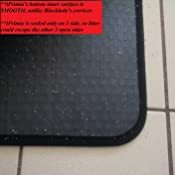 Relaces cat litter mats, no sift clean liners, cat rugs, and litter rugs..
Why iPrimio Cat Litter Mat? 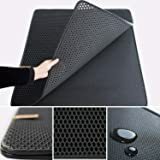 I have similar mats by Blackhole and iPrimio. 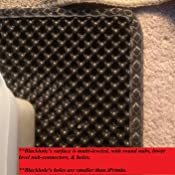 I've had the Blackhole mats for about a year, and the iPrimio mat for about a month. 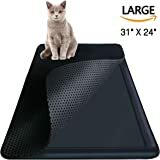 I have two 1 year old large cats and three litter stations. 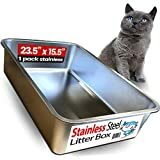 I use Sterilite 28-Qt boxes for litterboxes and Dr. Elsey's Precious Cat Kitten Attract Training Cat Litter (this litter has much SMALLER particles than other normal (adult) litter). 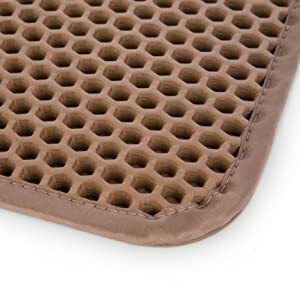 These mats come in smaller sizes, though I only have the largest sizes available. Here's a comparison of the 2 mats. --Latest attempt to purchase (July, 2016 from two different suppliers, AMZ and independent) failed. Three orders = three returns. 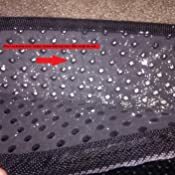 All mats had a sharp ammonia smell. *I like the bigger size of iPrimio. *The iPrimo's single sealed side does mean you have to be a little more careful when picking it up to pour litter back in boxes. So, overall, iPrimio is a good choice. 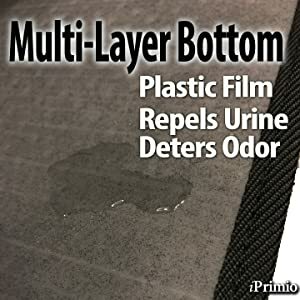 Both iPrimio and Blackhole are superior in design to just a rug or those PVC stringy mesh litter rugs that never seem to release the litter or allow for a good clean up of vomit. 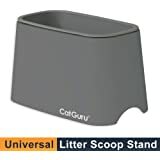 Both allow easy clean up of litter and to put it back in the box. If size were not an issue (and if the latest batch of mats weren't contaminated! 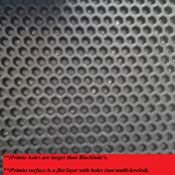 ), I'd likely choose the Blackhole mat over iPrimio for it's slightly better ability to contain litter. 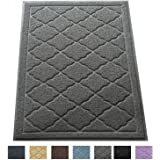 I saved for this mat for months and finally moved it from my Wish List to the cart for nearly $50. I'd say this mat has decreased the amount of litter tracked by about 60%. It doesn't catch all the litter, but I vacuum less and have been finding less pieces of litter in my slippers. 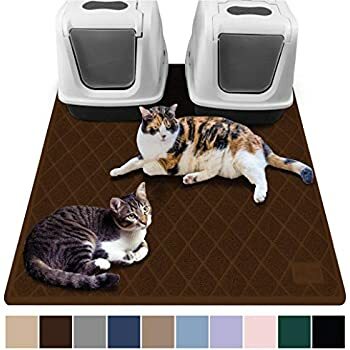 The brown color looks good on the brown apartment carpet--and the cats seem to prefer walking on this over walking on other litter mats. I saw one of my cats actually step out (instead of jump over; although it is too large to jump completely over) and then shake her paws out on it. 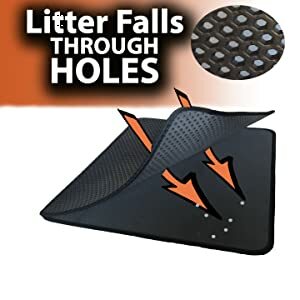 The holes catch much of the litter. 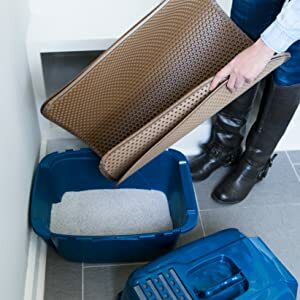 I've been using Tidy Cat litter, but think I'm going to switch back to World's Best Cat Litter or Arm & Hammer Clumping b/c they track less throughout the house. I anticipate that when I switch back I'll have even less litter tracked. So far so good. I just opened this. 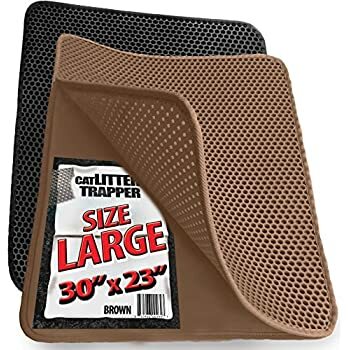 I got the jumbo, it's somewhat big enough for both litter boxes, I'm sure some litter will get out here and there. 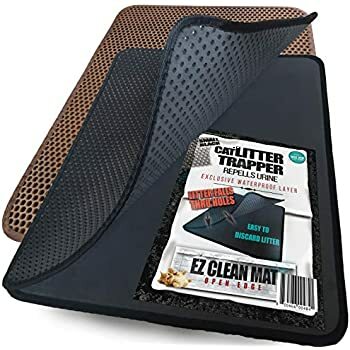 As you can see, I had to weight down one side of the mat with 42lbs bags of litter because it came a bit folded up, as you can see in the picture. Not a big deal, I'm sure with the weight it will stay down. 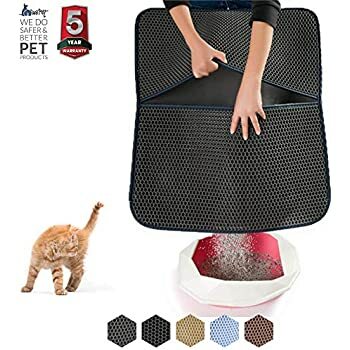 My cat did scratch at it, but he's a devil so I'm not blaming the company for this. 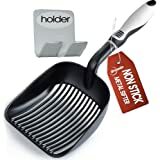 I have yet to see how well it picks up litter, so in a couple of days I will update my review. 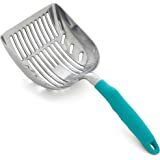 For the price I paid I have high hopes for this product. 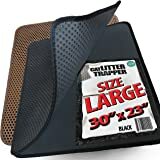 UPDATE: It's been a couple of days, I still have the two 42 pound bags of litter holding down the side that comes up because it's still not flat. However I did give it the full 5 stars because it has indeed collected a lot of litter. Yet I can still walk on it. It's amazing. 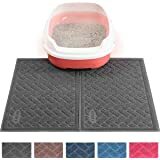 I do need to buy another one though, a bit smaller so I can put it in the doorway, since I have two litter boxes this one wasn't big enough to catch all the litter my kitties get stuck on their paws. These are a bit pricey but completely worth it! 5.0 out of 5 starsYAY it works!! I have been waiting to buy this mat for months because I just couldn't find it in me to spend the $50. After breaking down, buying it, receiving it, and using it for only a few days with my three cats, I can say it was worth every penny. 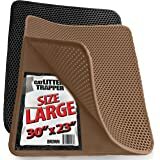 I'll need to buy another one because even the Jumbo size is too small for what I need. I'm no longer having to vaccum everyday and litter tracking is almost completely gone. Should have bought this sooner, but so glad I have it now!! 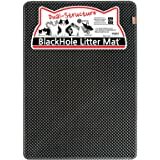 BlackHole Litter Mat Blackhole Cat Litter Mat - Extra-Large Size Rectangular 36" X 25"